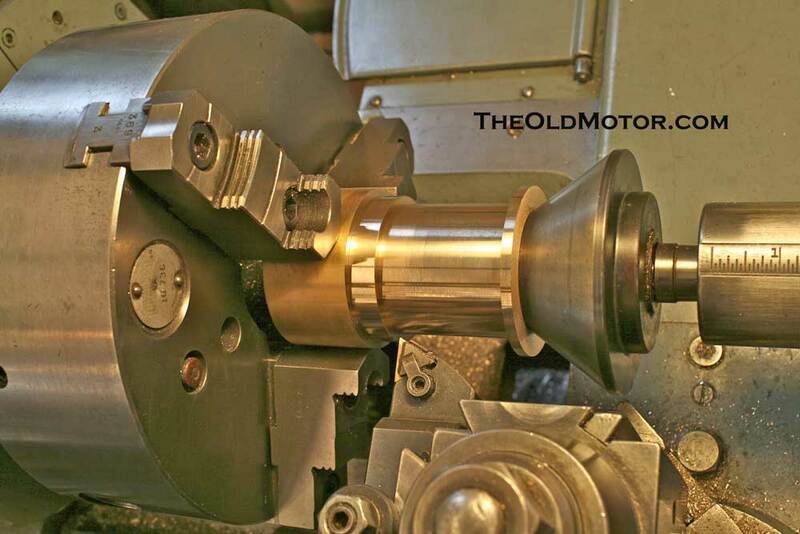 I posted this here for the benefit of MTFCA members and others that want to learn how to make their own bearings and babbitt them, not only for their Model T's but also the non-Fords that many of them own. And how to machine them. 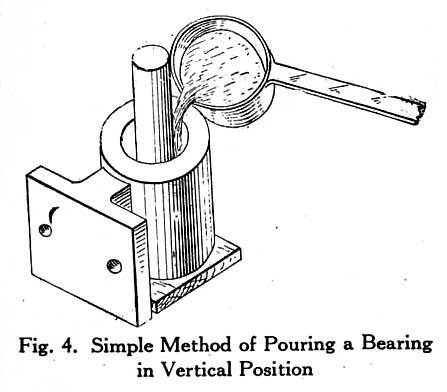 that will help people learn more about early plain bearings. die-cast bearings which were then entering the scene. was preformed on pre-war cars. Recently watched, on You Tube, a guy named Fennes pour some small babbit bearings and he too used that blackening method to prevent the babbit from sticking to the shaft when pouring. Very cool. You musn't scratch it as the stuff will adhere to any clean surface. Always wondered about that. Check back in at the post on T.O.M. 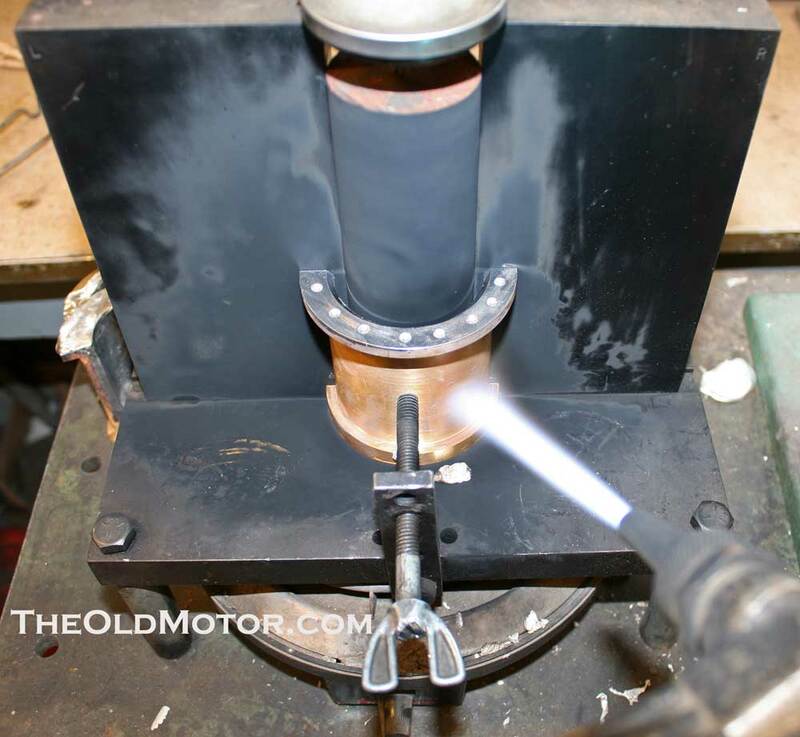 as we have added a video showing how babbitt is poured against a mandrel much as it is done on Model T main bearings. If you decide to try pouring babbitt be careful and follow all safety precautions. Read the Little Giant Babbitt Instructions in the link below. This is cool, but unfortunately not every Model T owner is wealthy enough to own the necessary shop equipment or smart enough to use it. BEFORE YOU EVER EVEN THINK about trying babbitting read everything you can get your hands on and really think everything over that you have read and come up with a plan. When I first tried it I would practice on something like a T or A rod. Pour it and then bore it in a lathe quickly just to see how it looked. You also need to check the bond that you have between the babbitt and the rod or bearing shell as it is very important. You want to use a good tin-based babbitt. When a lubricant film cannot completely separate the moving parts of a bearing, friction and wear increase. The resulting frictional heat combined with high pressure promotes localized welding of the two rubbing surfaces. These welded contact points break apart with relative motion and metal is pulled from one or both surfaces decreasing the life of the bearing. This friction and welding is most common when like metals, such as steel or cast iron, are used as bearings � they easily weld together. Compatibility of bearing materials, therefore, and absorption of lubricant upon the bearing surface, is necessary to reduce metallic contact and extend bearing life. 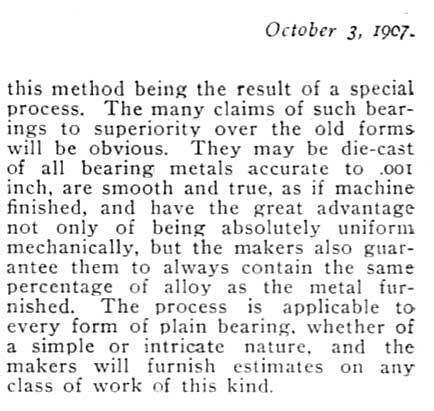 In 1839, Isaac Babbitt received the first patent for a white metal alloy that showed excellent bearing properties. Since then, the name babbitt has been used for other alloys involving similar ingredients. Babbitts offer an almost unsurpassed combination of compatibility, conformability, and embedability. They easily adapt their shapes to conform to the bearing shaft and will hold a lubricant film. Foreign matter not carried away by the lubrication is embedded below the surface and rendered harmless. These characteristics are due to babbitt�s hard/soft composition. High-tin babbitts, for example, consist of a relatively soft, solid matrix of tin in which are distributed hard copper-tin needles and tin-antimony cuboids. This provides for �good run-in� which means the bearing will absorb a lubricant on the surface and hold the lubricant film. Even under severe operating conditions, where high loads, fatigue problems, or high temperatures dictate the use of other stronger materials, babbitts are often employed as a thin surface coating to obtain the advantages of their good rubbing characteristics. 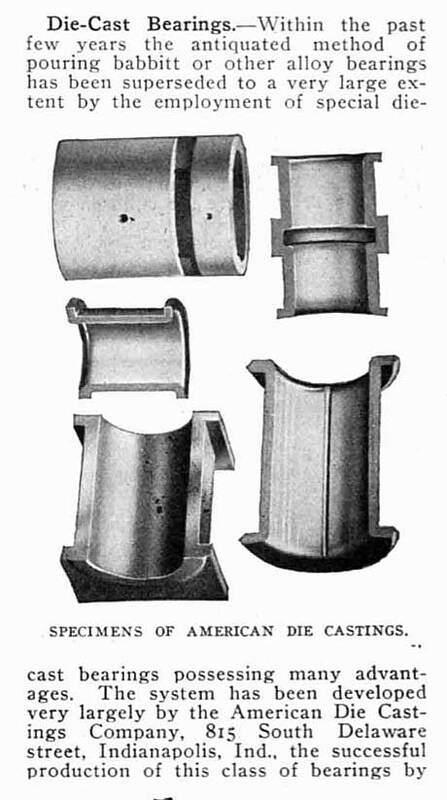 Babbitt metal is used as the lining for bearing shells of cast iron, steel and bronze. Fry manufactures two basic types of babbitt: (1) high-tin alloys (2) high-lead alloys. Both are relatively low melting materials consisting of hard compound in a soft matrix. The compounds found in each group are similar; it is in the composition and properties of the matrix that they differ. High-tin babbitt is used for high unit load and high operating temperatures. They display excellent corrosion resistance, easy bonding, and less tendency for segregation and welding. They are preferred for use under steady load conditions in steam and gas turbines, electric motors, blowers, and pumps. Lead-based babbitt is prone to separate into elemental lead and tin and has a lower thermal conductivity. Users of babbitt ingot melt the metal in iron kettles from which they can ladle or pump the molten alloy. The bearing shell or backing is pre-coated with tin for tin-base bearings or with lead/tin for lead-base bearings. While the coating is still molten, the white metal is cast onto the backing and allowed to solidify from the bond inward. This prevents contraction cavities at the bond and restricts the growth of intermetallic compounds at the interface between the bearing shell and the babbitt. The lining is then machined to a mirror-bright finish and specified thickness. Babbitt can also be sprayed onto the bearing shell with the use of a flame arc gun and Fry�s babbitt wire. With increasing legislative concern over the hazards of lead in the work place, more companies are interested in lead-free alternatives. The first step to switching to a lead-free babbitt is to determine which alloy is currently used. If the alloy is unknown, a sample can be analyzed by Fry�s laboratory in Altoona. Tin-based babbitts, with exception of Grade 1, are superior to all lead-based alloys. The mechanical properties of the tin-based babbitt increases steadily for Grade 11, Grade 2 and Grade 3. Grade 2 or Grade 3 can replace any lead-based alloy and show improved wear characteristics. Grade 2 is also available in wire form for flame spray metallization. Grade 11 is similar to Grade 2, but the higher copper makes alloy segregation a problem. It is much more difficult to produce a uniform alloy. This leaves Grade 2 as the preferred alternative and Grade 3 as a higher strength option. The maximum lead allowed in a tin-based babbitt is 0.35% for Grades 1, 2 and 3, and 0.50% for Grade 11. There is no legal definition of a lead-free babbitt, although the 0.20 maximum specified for plumbing is frequently used. Customers who pour bearings are interested in reclaiming old babbitt from worn bearings. Invariably, they mix a lead alloy with new tin-based babbitt. Mixing these two causes the low melting 63Sn/37Pb eutectic to be formed. 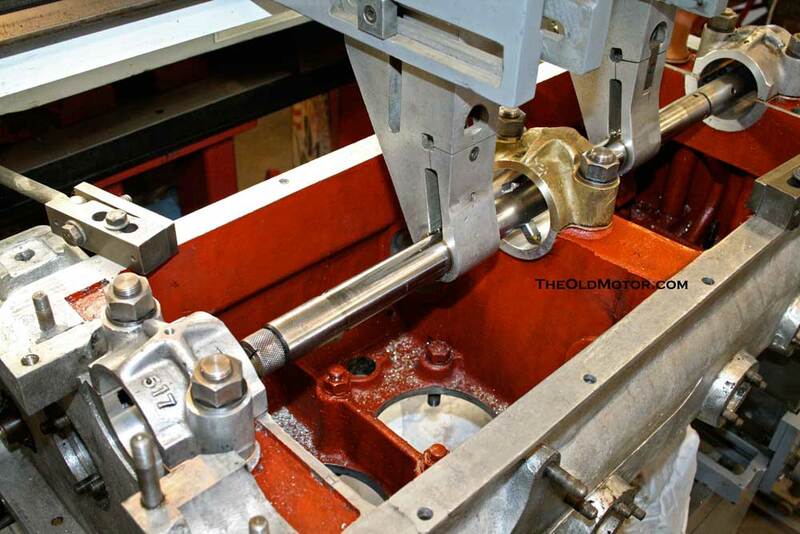 This babbitt will selectively melt out of the lining and leave a �sponge� like bearing. The 63/37 melts at 361�F and the Grade 2 babbitt does not completely melt until 669�F. A premature bearing failure is the result. A user should not mix unknown babbitts and all pots, mixers, and ladles should be free of lead. Even if the babbitt is a known tin-based babbitt, no more than 30% of a pour should be recycled alloy. A larger amount can cause excessive dross to be trapped in the casting. Drive carefully, and enjoy, W2"
"This is cool, but unfortunately not every Model T owner is wealthy enough to own the necessary shop equipment or smart enough to use it." You can get into this without spending a lot of money. Used equipment is not that hard to find and you can start out w/a portable align-boring machine w/out spending a lot of money. 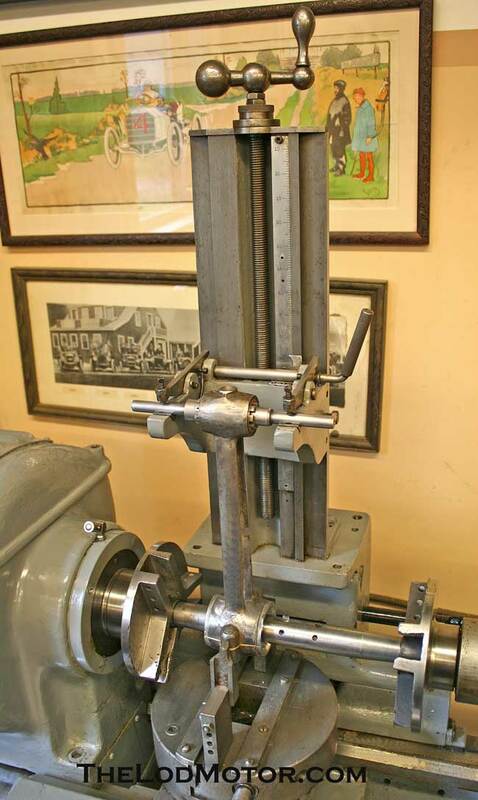 You can buy re-babbitted rods until you find a rod boring machine. I did it all 25 years ago on a shoe string budget and you can to if you really want to. If you are resourceful I bet you could tool up for $500-$1000. I made new shells for a '16 Briscoe engine. It has a"fork and blade" type of connecting rod arrangement. So your technique of machining the shells round and then slitting them to add shim space wouldn't work for them. I had to start with the bronze in two halfs held together and then machine the outside exactly. Then I made a holder which held the parts together so they could be rough bored. Then babbitted and then bored exactly to size with about.002" clearance. They worked out great All fun!!! 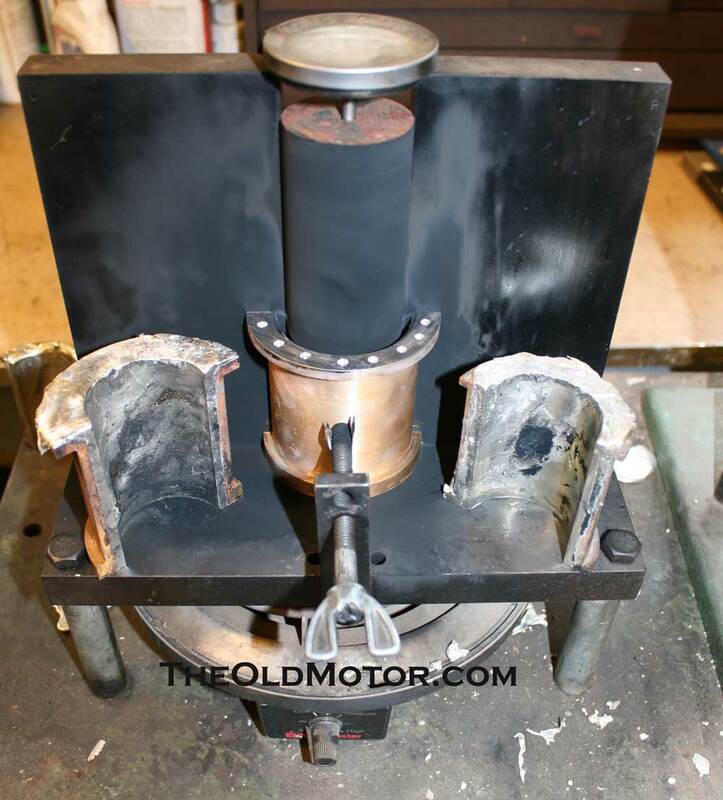 Les, Is the insert free to move in the inside of the rod like a flathead Ford V-8 does or are they stationary? "With a fork and blade the shell is clamped tight in the fork and the blade floats on the outside"
Les....Does the blade rod run on bronze or did you also babbitt the outside? 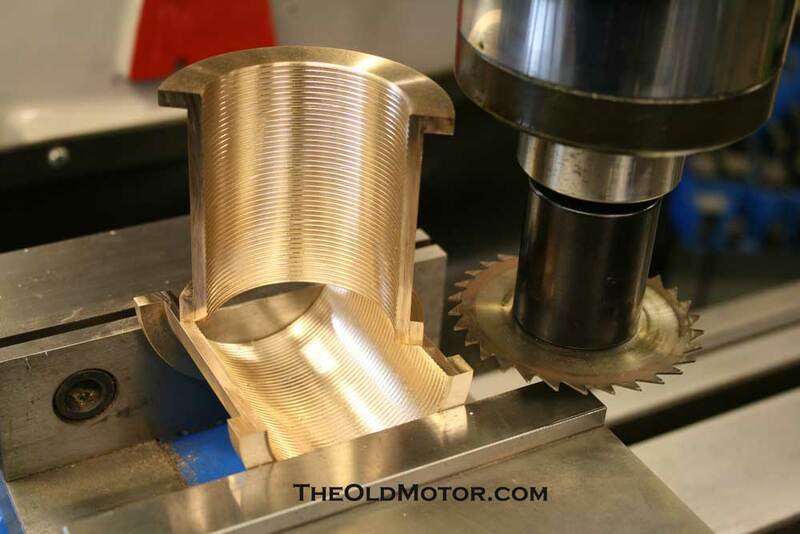 Just to let you know, I am really enjoying this thread and find David's posts interesting and inspiring to this amateur machinist. The blade runs right on the babbitt. But remember it is only rocking back and forth. On the flathead V8's with the full floating rod bearings, the bearings had babbitt on the inside against the crank, but were often bronze of similar against the two rods. I need to correct myself. The blade runs right on the BRONZE!!! 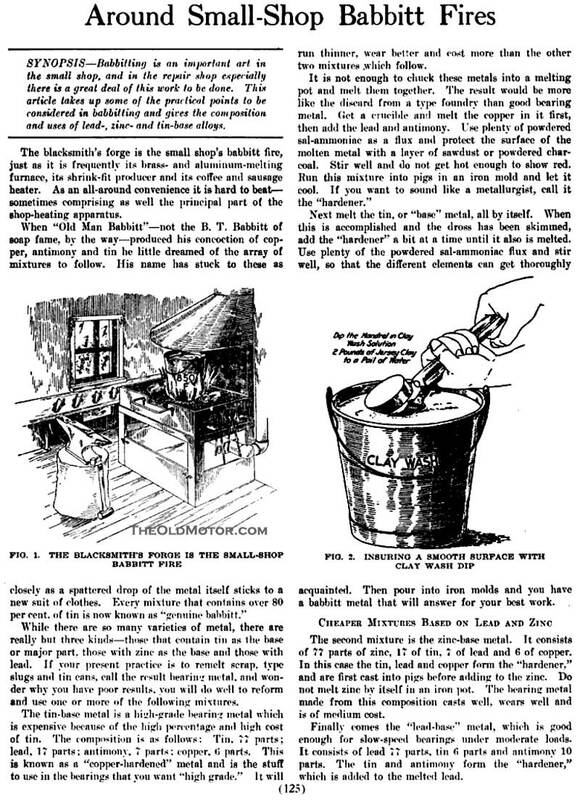 Another interesting article from the American Machinist, December 9, 1915 issue can be seen above, where you can also learn more about the art of babbitting.